With the F-Pace and recently unveiled E-Pace and all-electric I-Pace, Jaguar is embracing SUVs like no other, but thankfully there’s still space in the range for a traditional big estate. The first generation Jaguar XF Sportbrake (2012-16) was one of my all-time favourite estate cars, so the new model has a lot to live up to. I was one of the first journalists to get behind the wheel of the new Sportbrake, and the good news is that it’s better than ever. 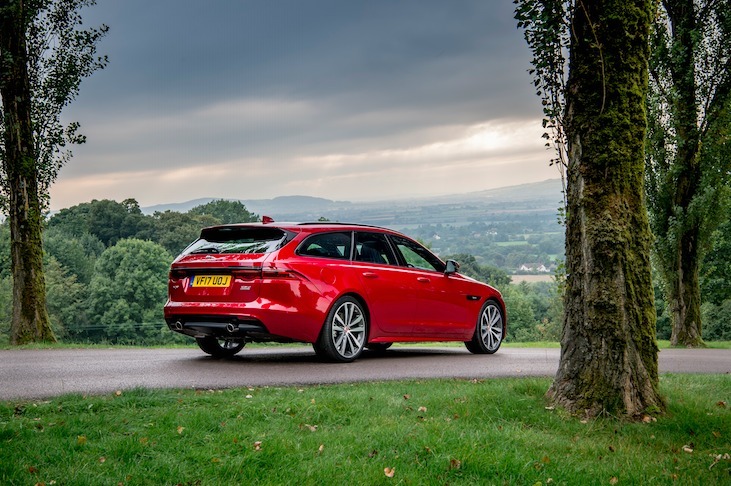 Unlike the previous car, the new XF was designed with an estate version in mind from the outset. And it shows. Slightly lower, shorter and even sleeker than its handsome predecessor, it turns heads like no other load-lugger on the road – and with a drag coefficient of just 0.29, it’s seriously aerodynamic. Aimed squarely at its German rivals, the BMW 5 Series Touring, Mercedes-Benz E-Class estate and Audi A6 Avant, plus the Volvo V90, the new XF Sportbrake will be sold in more global markets than ever. You see, Jaguar has high hopes for the car because the previous model used to account for a fifth of XF sales, plus not everyone wants a big SUV. Many prefer a good old estate which offers practicality alongside the handling advantages of a conventional car. Indeed, it’s thought that some dog owners, for instance, actively shy away from high-riding 4x4s because the jump up isn’t ideal for smaller and older pooches. The entry level car comes with a 161bhp 2.0-litre diesel capable of returning 62.8mph with emissions of just 118g/km of CO2. However, it’s the only model in the range available with just rear-wheel drive and manual transmission. Next up is a 178bhp version of the same engine, predicted to be the biggest seller, followed by a third unit delivering 237bhp. For those looking for more performance, there’s a potent 3.0-litre V6 diesel delivering 296bhp and a 247bhp 2.0-litre turbo petrol unit. I tested the most powerful of the 2.0-litre diesels (237bhp) in all-wheel drive R-Sport trim, which is above Prestige and Portfolio, but below the range-topping S spec. The Sportbrake range starts at a very reasonable £34,910, though my model will set you back £44,600. In fact, it was loaded with more than £20,000 of options including special dark grey 20-inch alloy wheels (£2,095) and Climate Front Seated with Heated Rear (£840), bringing it up to a hefty £65,315. The interior of the Sportbrake is familiar to existing XF owners up front with a combination of space, quality and equipment. The rotary controller for gear selection still rises reassuringly from the centre console between the front seats, while the air vents also slowly revolve, ready for action. 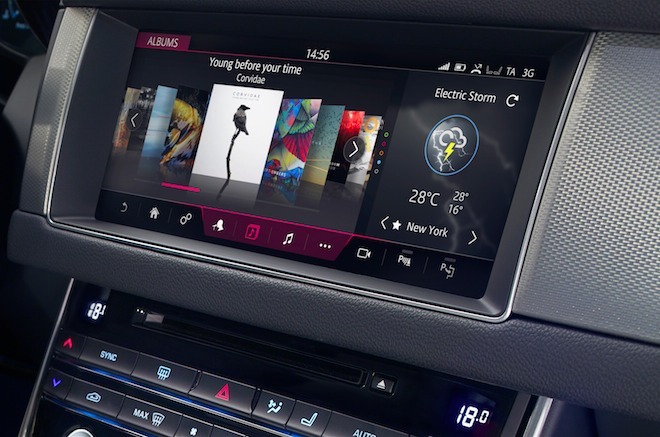 Jaguar’s much-improved InControl infotainment system is fitted as standard with an 8-inch screen, though my car featured the optional InControl Touch Pro, boasting a big 10.2-inch screen. Good though it is, it’s still not as stylish and futuristic as its main rivals. Ahead of the driver a full-colour 12.3-inch digital instrument cluster can be specified – my car also came with a Head-Up Display (£1,270) which shows your speed and other basics including sat nav directions. It’s also packed with driver aids and safety systems such as Adaptive Cruise Control and Blind Spot Assist which will steer you away from an out-of-sight vehicle If you begin to change lanes. 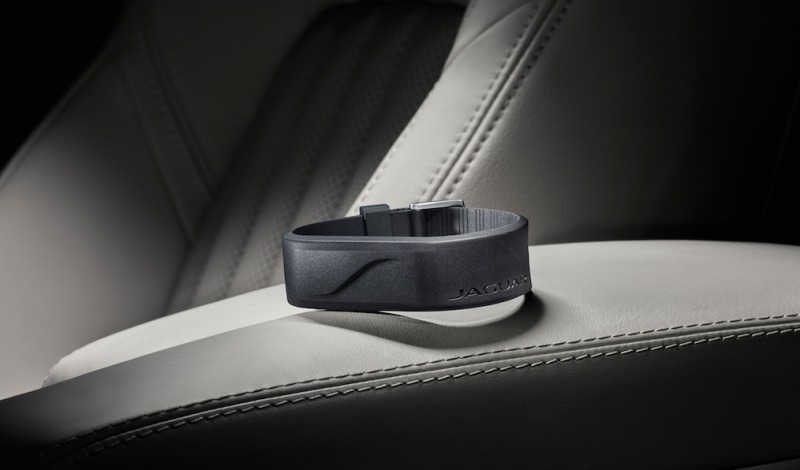 Oh, and an honourable mention for Jaguar’s wearable Activity Key. The waterproof, shockproof wristband is ideal for those who enjoy outdoor pursuits such as running, cycling and watersports. Simply locking the car with the Activity Key will disables any keys left inside, then when you come back, unlock the vehicle by holding the rubber wristband close to the Jaguar lettering on the tailgate. The seats are comfortable, visibility is good and there’s plenty of space. 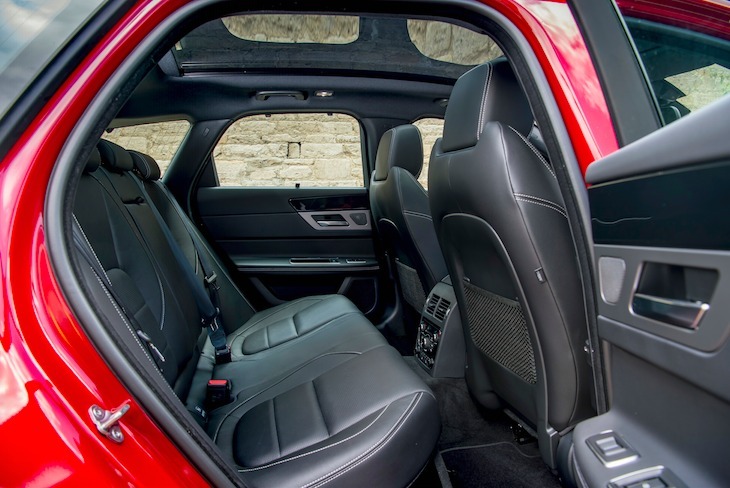 That theme is continued for rear passengers, where there’s plenty of leg and headroom – even for taller adults. Opt for the full-length fixed panoramic roof and light floods into the cabin, but if it’s too bright the gesture-controlled sunblind will ease over the glass expanse. But of course the big difference is further back where the wide-opening tailgate (also gesture controlled) gives access to a decent 565 litres of luggage space, or 1,700 litres when the 40:20:40 split-folding rear seats are flipped. Smaller items can also be stored beneath the flat load floor in the boot. Press the Start button, head off and it’s clear that you’re driving a diesel. It soon settles down, but it’s not the class-leading refinement offering by BMW. The engine itself is powerful enough for most with plenty of grunt, while the automatic gearbox is as smooth as can be. For the record, it can hit 60mph from standstill in 6.4 seconds and top out at 150mph, while its towing capacity is up to 2,000kg. On paper it’s capable of up to 48.7mpg, but I got closer to 40mpg on my test runs. CO2 emissions are a reasonable 153g/km. Good though the 2.0-litre diesel is, I suspect the fantastic V6 unit will give the car a whole new dimension, just as it did in the original. Unlike some estates, the Sportbrake is no longer than its saloon sibling. Its handling is not dissimilar to a regular XF either. This is no wallowing load-lugger – the Sportbrake is surprisingly agile and an effortless cruiser. There’s also plenty of enjoyment for more spirited drivers. Not only can you override the auto box by using the paddles behind the steering wheel, but you can change the drive mode too – Dynamic offering faster shifts and a more responsive kickdown, while adaptive damping tightens body control. Naturally, there’s stacks of traction thanks to all-wheel drive, while body roll is kept to a minimum and the steering is as accurate as ever. In fact, there’s a lot of clever technology going on to make the car as rewarding to drive as possible. Frankly, the XF Sportbrake is hard to fault, and any minor quibbles can be forgiven because of its devastating good looks. However, I would definitely go easy on the options list because a competitively priced car might suddenly end up looking expensive. 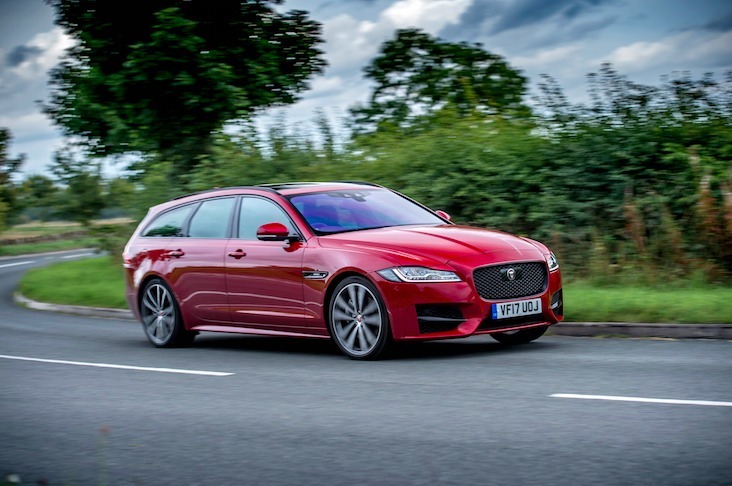 Verdict: The new Jaguar XF Sportbrake is the best-looking estate car on the market. Engaging to drive, spacious, practical and comfortable, it’s a class act able to hold its own against some tough opposition.